Weddings are all the rage again around Bubba and I. Nothing will ever be like our first summer together-- We were invited to 7 weddings! Yikes! Talk about Pressure! 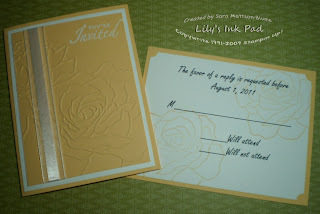 I've been asked by a few folks if I can create invites- of course. Here are some examples I received in a swap for ideas. 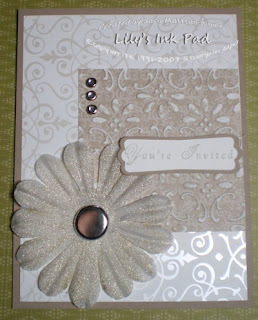 Of course, I can create anything that fits your personal style! This one uses an embossing folder and a coordinating stamp set to create an elegant package--and could be replicated in any of Stampin' Up! 's 48 original colors, 12 nuetrals, and 6 in colors! 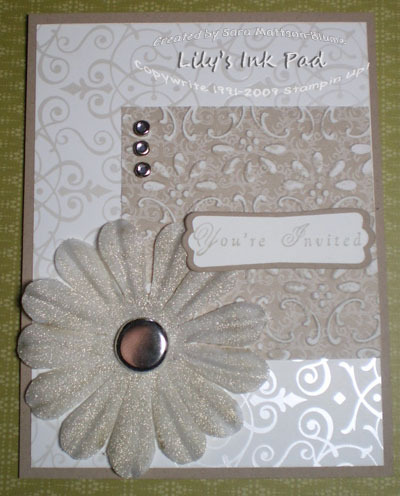 My photo of this one just doesn't do it justice, but you can kind of tell the texture and diversity that create the elegance of this invite: the flower is sparkly gold, the paper has a foil embossed layer and a textured and sanded layer. Beautiful!